This past year went by in a blur, and out of all the nonfiction and fiction books that I read, I'd like to offer 10 books that challenged me and that you should consider checking out this new year. Ranging from reportage to essays to fiction, this list blends classics, bestsellers, and quirky works that caught my attention and changed my focus as a human being just as much as a professional designer. Have any books that challenged you in 2013, that we should read in 2014? I'd appreciate if you could leave them in the comments! 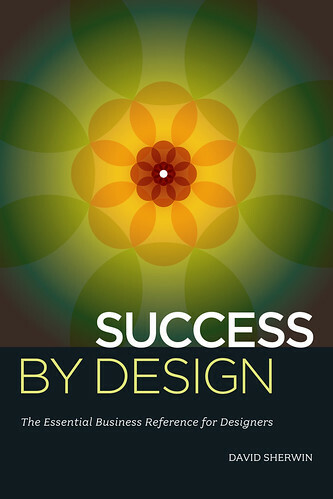 My Second Book "Success by Design" Is Officially Out! 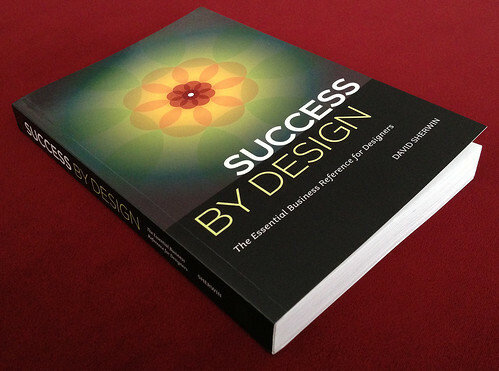 My second book, Success by Design: The Essential Business Reference for Designers, came out early! 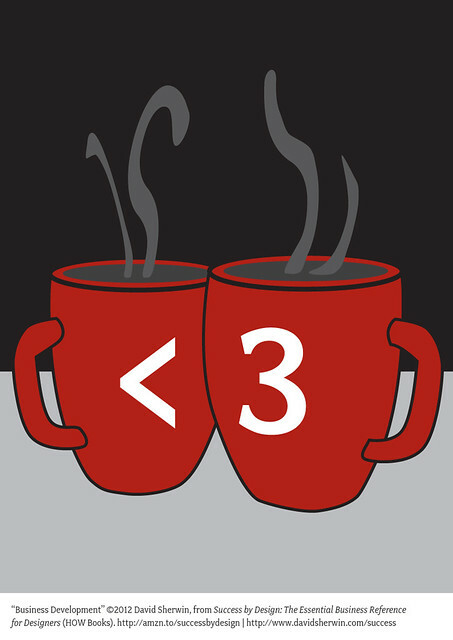 You can purchase it at your usual online retailers, including Amazon.com, Barnes and Noble, and My Design Shop. You can also grab a copy at your local fine bookseller when it arrives in stores on December 4th, 2012. Concurrent with the print edition is the release of the eBook, which you can get for Amazon Kindle and through iTunes for your Apple devices. Want to read a bit of the book before getting a copy? Other than clicking to look inside on Amazon.com, you can also see a preview through Google Books. In your career you may have been like me: Trying to keep projects on the rails and clients happy. Digging through blogs for useful advice. Wondering if there was a better way to handle all of the demands of being a design professional and running a creative business. The wisdom contained in Success By Design: The Essential Business Reference for Designers will help you become a stronger businessperson and better plan your career path as a design leader. This book was born from in-depth interviews with a slew of successful designers, studio directors, project managers, and client service professionals across a wide range of creative industries. It contains the business secrets I needed the most when I started as a designer sixteen years ago. If you'd like some background on how this book came about, I was recently interviewed by GraphicDesign.com about what inspired the book. In the coming weeks, excerpts of chapters from the book will be appearing here on ChangeOrder and in other publications. There are also a number of free worksheets and resources mentioned in the book that I'll be blogging about. Links to them are aggregated on my website at http://www.davidsherwin.com/success. 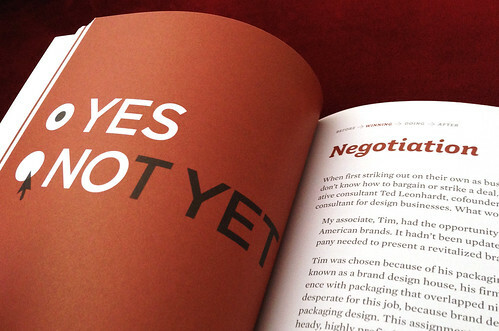 "The best design business secrets are out of the bag--and it is about time! David has found a pithy and brilliant way to share the wisdom and knowledge that most of us had to learn the hard way. 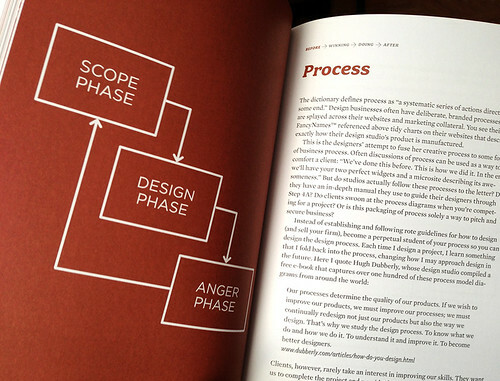 I wish I had this book when I was learning to run a design business unit at IDEO." "With your nose up against your monitor, it's easy to lose sight of the big picture. This book reminds you to step back and take inventory of all of the things that impact the success of your projects, products, and teams." "The world of design is famous for its mystique, secrecy and "special sauce" but David Sherwin breaks it all down into the three fundamentals of team, client and project management, taking out the complexity of what it's like to run a design practice along the way. He organizes the book with straightforward concepts and follows up with easy-to-understand language. But make no mistake. This is not a primer, but rather an insightful work drawn from a keen understanding that the essential element to being successful in design (and therefore with clients) is the human element." "David's comprehensive and thoughtful treatment of the business of design is an education by proxy. As any experienced consultant, he maintains a fine balance of caution and enthusiasm yet withholds nothing, offering a depth and care typically only found in the classroom." Looking for a good book to cozy up with this summer? I've been saving up book recommendations for this coming holiday season (much in the spirit of 2009-2010 and 2008-2009), but I couldn't wait to recommend the following books for your designery beach-reading pleasure. 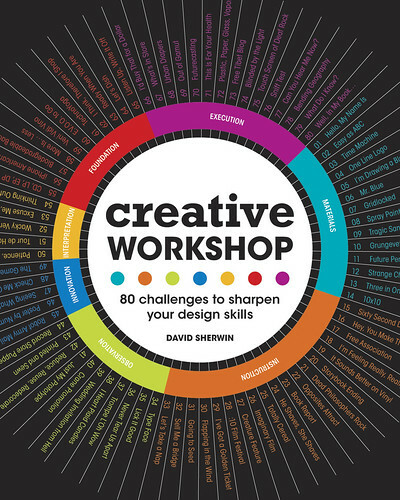 Feel free to also throw into your cart the pre-sale for Creative Workshop: 80 Challenges to Sharpen Your Design Skills, which went up on Amazon.com today. Cover for "Creative Workshop: 80 Challenges to Sharpen Your Design Skills"
I'm excited to share with you the cover for my first book, Creative Workshop: 80 Challenges to Sharpen Your Design Skills, due out in November 2010 from HOW Design Press. Kudos to Grace Ring, the art director and designer at my publisher that put together this very sweet cover. 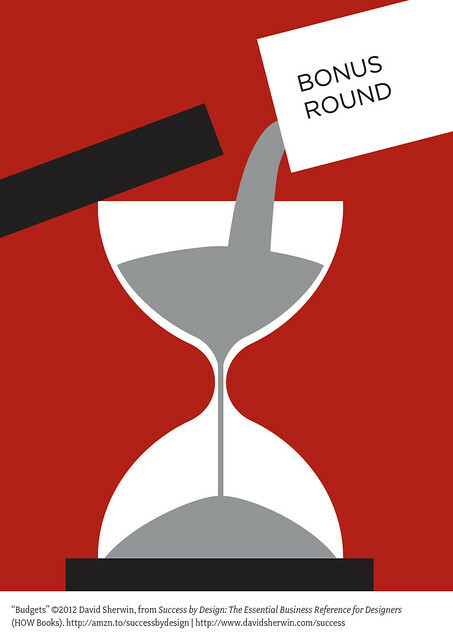 Have you ever struggled to complete a design project on time? Or felt that having a tight deadline stifled your capacity for maximum creativity? This book is for you. Within these pages, you’ll find eighty creative challenges that will help you reach a breadth of innovative design solutions, in various media, within any set time period. By completing these challenges, you’ll round out your skills by exploring projects along the full continuum of design disciplines, from the bread and butter of branding and collateral to the wild world of advertising to the user-centered practices of creating interactive projects. Along the way, we’ll take brief forays into wayfinding, editorial design, video and motion graphics, and many other areas of our continually expanding practice. To aid you in conquering these challenges, I’ll provide you with useful brainstorming techniques and strategies for success. By road-testing these techniques as you attempt each challenge, you’ll find new and more effective ways of solving tough design problems and bringing your solutions to life. 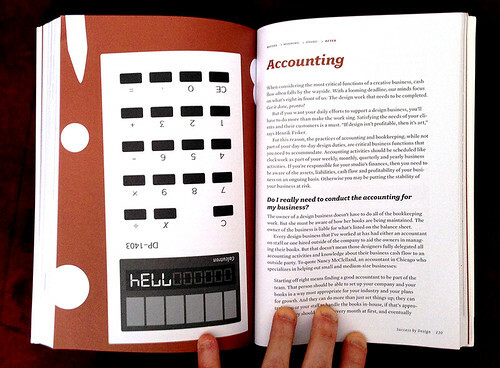 The book is illustrated by a range of professional designers, students, and teachers across all disciplines of design. When layout is finished, we'll be able to share the final list of those included. If you want a taste of the material in advance, check out my presentation at the 2010 my talk at the HOW Design Conference entitled "Better Ideas Faster: How to Brainstorm More Effectively." Seems like a simple question, doesn’t it? Paper should be a better choice, because it will biodegrade. Plastic will go on forever in landfills and choke our oceans. Well, my answer isn’t very well informed. There are major trade-offs in the consumption, production (and related pollution), and recycling opportunities for every seemingly simple decision that we make throughout our lives, both as consumers and as designers. And this is the crux of Nathan Shedroff’s useful book, Design Is the Problem: The Future of Design Must be Sustainable. Within its pages sits a fully realized schema of the minutia that working designers and students need to internalize in order to start making more educated decisions regarding the sustainability of their client and personal projects. Being mindful about sustainability—both in the products and services we design, and in the decisions we make as consumers and creators in an ever-evolving economy—can be an astoundingly complex and time-consuming undertaking. Continue reading at The Designer's Review of Books. 'Tis the season to give books—and read a few yourself! Here are fourteen books that I recommend purchasing for your designer friends and/or yourself to enjoy in this upcoming year. You can also check out last year's holiday bookshelf. The further I’ve progressed in my career as designer, the harder it’s become to share with others exactly what I do. First, I managed layout at a magazine and bootstrapped a few websites in thrilling Adobe PageMill. Then, within a design studio, I was responsible for creating brands and annual reports—with little to no formal training to the otherwise. Add in a number of years in advertising and marketing, leaven it with a few more of user research and wireframing, and set to “Puree”. When I try to describe to my family what I do nowadays as an interaction designer, the confusion level continues to increase. Now I don’t need to try and explain anymore. I can just send them a copy of Warren Berger’s extraordinarily well-written book, Glimmer: How Design Can Transform Your Life, Your Business, and Maybe Even the World. This is the first book about the process of design as it’s practiced at its highest levels in our profession, written by an expert journalist for the layperson, that describes exactly how designers think about and view the world. It is the product of hundreds of interviews with today’s top designers, across all major disciplines of design, cross-referenced with deep reading into the texts that have informed the growth of our profession, then distilled into plain English that anyone can easily understand. Along the way, stories regarding OXO Good Grips, the One Laptop Per Child program, the Truth anti-smoking campaign, Bruce Mau’s Massive Change exhibit, Architecture for Humanity, Proctor & Gamble, TOMS Shoes, and many others are woven through the narrative, illustrating key points regarding design concepts, principles, and sustainability practices with illustrations and sketches. It also includes a good number of everyday people who came to the design profession late in life, after they had their first “glimmer” moment. Review of "The Designful Company"
From the airy confines of interior design to the tailored minutae of the type designer, the varied disciplines of our profession continue to rush outwards like galaxies fleeing the Big Bang. And the force that drives our profession’s expansion? The universal process we call design. As designers, we have lived and breathed this process often enough to embody its power, in whatever domain we choose. For a businessperson, however, design is nebulous. A slippery fish. When placed on a slide under the accountant’s microscope, design can perish—even in the most progressive corporate culture. And without design, there is no innovation. Read my full review of The Designful Company on The Designer's Review of Books. We’ve all had this reaction when encountering a product or service that just didn’t cut it. I kept thinking about my alarm clock while I was reading the all-too-brief Subject to Change: Creating Great Products and Services for an Uncertain World. This book was penned by three current Adaptive Path employees, including their president Peter Merholz, and their emeritus director of technology, David Verba. Adaptive Path (AP) is well known as one of the global leaders in providing product experience strategy and design services. As part of their overall business strategy, AP provides training and events to help educate designers, managers of design, and business executives on many of the topics of discussion in Subject to Change. I have read and loved most of the other books written by AP staffers, such as The Elements of User Experience and Designing for Interaction. They have been formative, in every sense of the word. So why am I comparing this book to my alarm clock? When I was a child, Hebrew was beaten into me by a series of well-meaning teachers. Upon reflection, they were probably my first foray into hand-lettering type. Sadly, the letters stuck, but comprehension of the words peeled away past my teenage years. I have always had a nagging thought in the back of my head that if I’d seen a clearer historical thread between Hebrew and modern English, I would have better retained the language. Shapes for Sounds, a lovingly crafted book by Timothy Donaldson and published by Mark Batty, explores the birth and maturation of the Latin alphabet in both written and spoken mediums across the whole of Europe and the Middle East, and so much more. It clearly demonstrates the path from the first recorded alphabets all the way to our native tongue of English through the lens of my first love as a designer: typography. Perennially, I'll share what books are stacked up on my desk here at ChangeOrder. I can vouch for a few of these tomes, as I'm currently re-reading them, while others are new acquisitions that I'm eagerly itching to curl up with over the holiday. 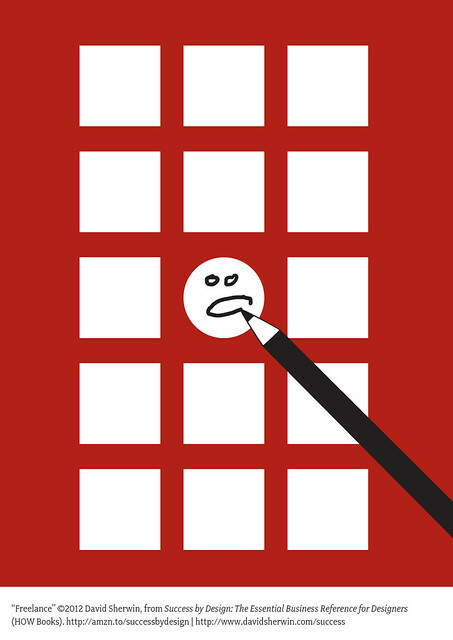 80 Works for Designers in Seven Weeks? If you were to take a class called 80 Works for Designers in Seven Weeks, what kinds of projects would you expect to tackle in that intentionally ludicrous timeframe? One of my first roommates post-college was a graduate student in poetry. In the summer of 1999, I recall him being excited that he had signed up for the class "Instant Thesis, or 80 Works in 7 Weeks," which was being taught by the eminent poet Peter Klappert. Dozens of late nights and weekends later, neck sore from hunching over his computer and notepad, nerves shot by a bold overdose on black coffee, he was a complete wreck... but a more powerful writer as a result, by an order of magnitude. Many students found it to be one of the most revelatory creative experiences of their lives, expanding their writing ability in ways they hadn't imagined possible through traditional workshop methods. After working through several stages of nervousness, failure, physical and emotional stress, intellectual stretch, loss of self, and high anxiety -- often in rapid succession -- they broke through many artistic barriers into something profound. The entire class explored collage methods, blot-outs, concrete poetry, metric/fixed forms, linked verse, anaphora, dialogue, satire, visual shape, collaborative writing, fixed and loose rhyme schemes, musicality, tone, and dozens of other approaches in the pressure cooker. They had also accumulated hundreds of exercises, generated by the class, that could feed future work. Would it possible to cram 80 wildly divergent design exercises into the course of seven weeks, forcing a student to expand the full breadth of their abilities in a finite period of time? Would design students in such an environment become better designers at an exponentially faster rate, with substantially better portfolios? What I hope that design students would get out of (barely) surviving this designer-focused course would be twofold: 1) an idea of how to reach a breadth of innovative design solutions, in various media, within any set time period; and 2) a fuller understanding of the complementary skill of learning how to properly frame a design problem before it can be solved. I'm not sure if Peter Klappert has repeated his course since, but a record of his working process still exists, which was adapted from a Corcoran School of Art class. From his methods, I've been attempting to extrapolate a similar bare-bones approach that could be attempted by design teachers and students. I'd like your help in determining what those 80 Works for Designers could be for an initial seminar. Everyone whose exercise gets used will be credited, and I will put together a Web site that disseminates the class methods and lesson plan for anyone who wants to inflict this idea upon an unsuspecting design institution. Since the 80 Works class will generate hundreds of exercises, this initial seeding of starter exercises will grow into a very large body of work very swiftly that many people can use for their own creative growth (I hope). Feel free to post your ideas here as comments or email them to me at david at davidsherwin.com. And thank you, in advance, for the help.